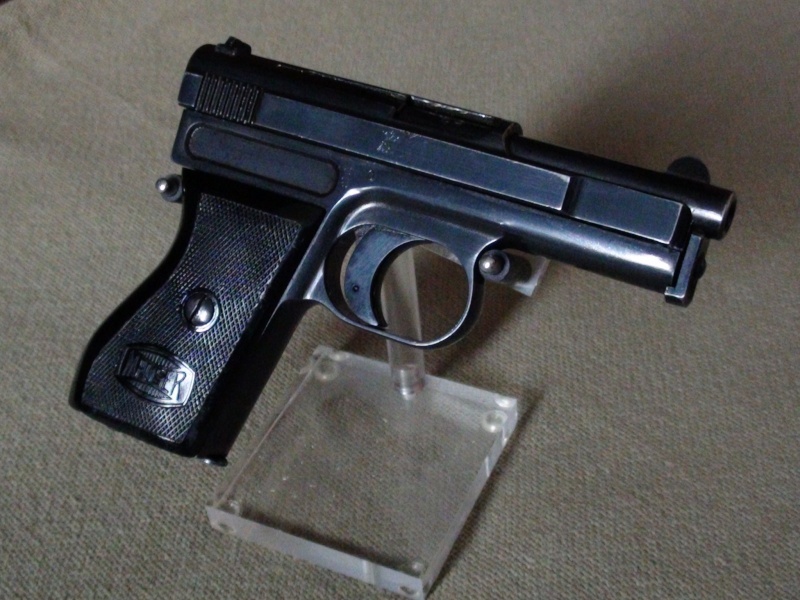 What do you think about this unusual Mauser pistol ? It seems to be a mod. 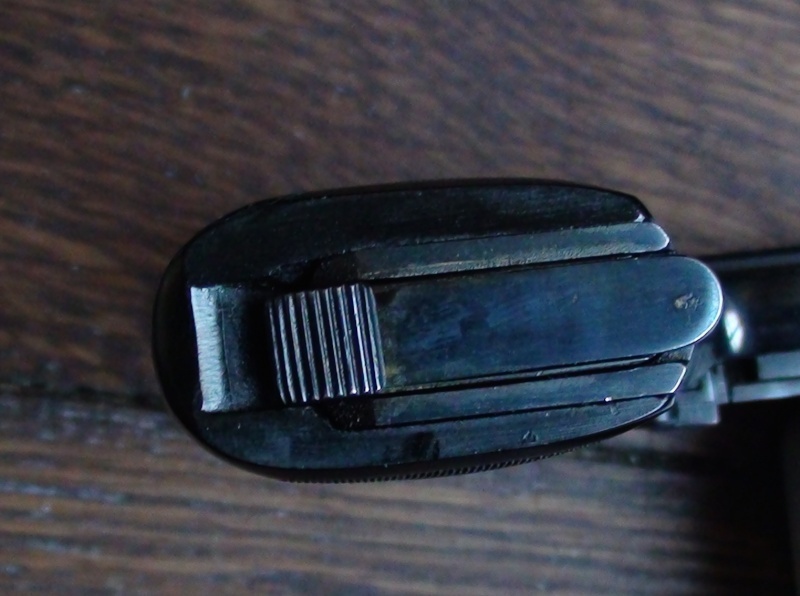 1910 (slide type, caliber 6,35, magazine latch, magazine with flat bottom) but with a "square" rear frame and without "sidelatch", with black "sort of plastic" grips, with only one serial number on the left of the slide but only a "0" on the right side of the frame, and with a particular "cut out" on the right side of the frame. It is a very unusual example and I am not sure what to make of it. Where did it come from? Is there any provenance with it? The frame has .32 caliber Humpback features as well as Sidelatch features. 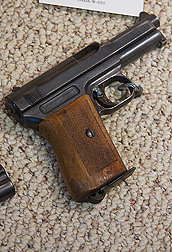 The grip is from a 1910/34 and appears to not fit like it should. I would suggest that they where replaced at some point. The front sight is not what I would expect but there are many things that are not what I would expect. 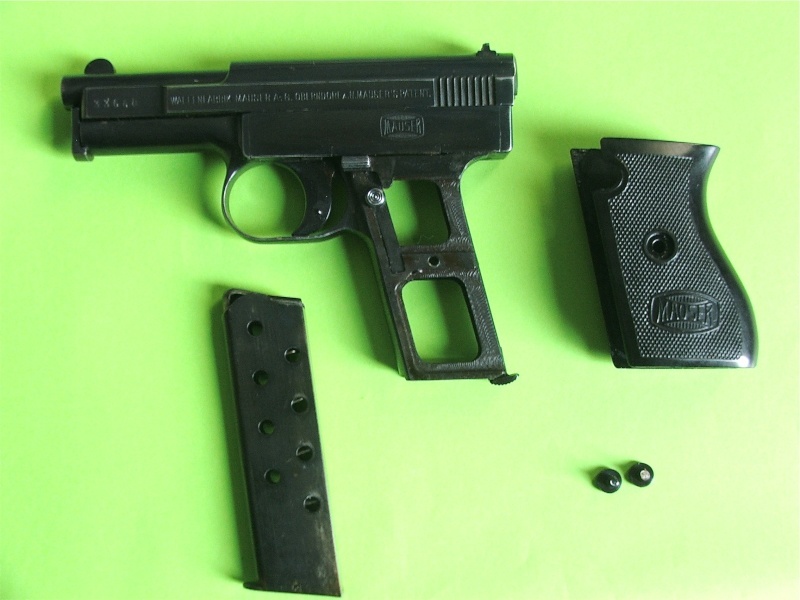 The slide is 1910/14 new model. The magazine appears to be an aftermarket. What caliber is it? What is the serial number? I would almost say it has been photo-shopped but 3 different images? I would need to do an in hand examination and disassemble to comment further. No, it hasn't been photoshopped and I can do other pictures of it, since it is in my posession. I do not know anything of its provenance, since the french seller didn't know either of it. yes, but without the sidelatch, that is the point. I saw some specimen with this square-ended frame but WITH sidelatch, and other WITHOUT sidelatch but with an "angle" at the rear of the slide. The front sight is OK for a Mod. 1910 for me. Why wouldn't it be? Okay, then here are some more observations. I believe it is real. I just made the photo shop comment because it looks to be made up from different caliber and model variations. The French seller does point to the possibility that this came out of the factory collection. 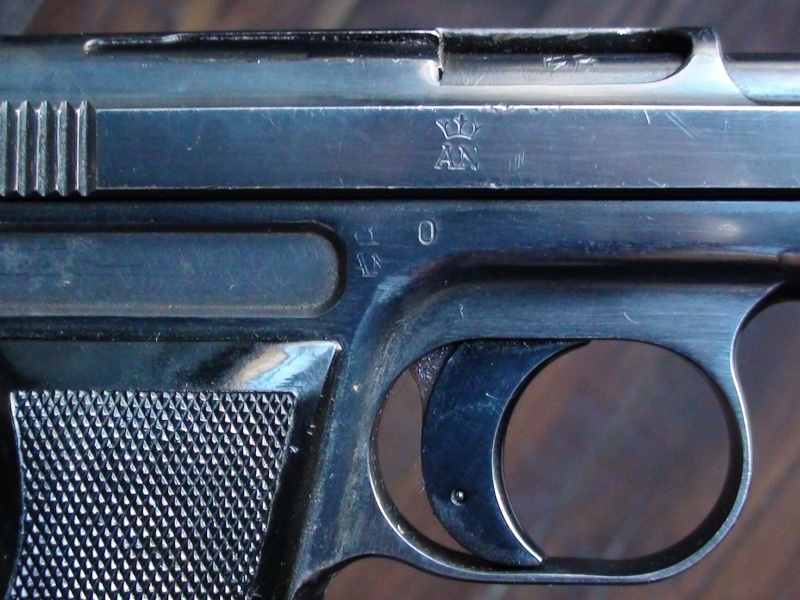 The “Mauser train” was looted in France and the French took possession of the factory post war because it was in their sector. The cut out in the side plate (left side) is a humpback feature. The milled panel on the right side is typical of Humpbacks, 1914 early production and 1914 war era examples but only .32 caliber examples. 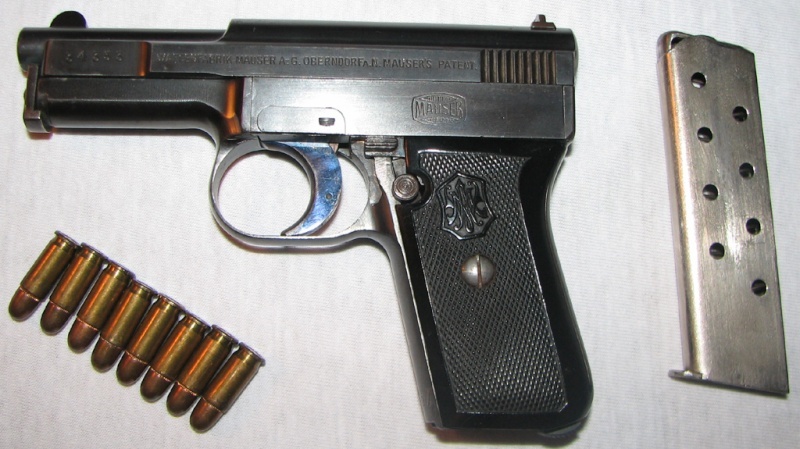 This is the first time I have seen one on a .25 caliber. 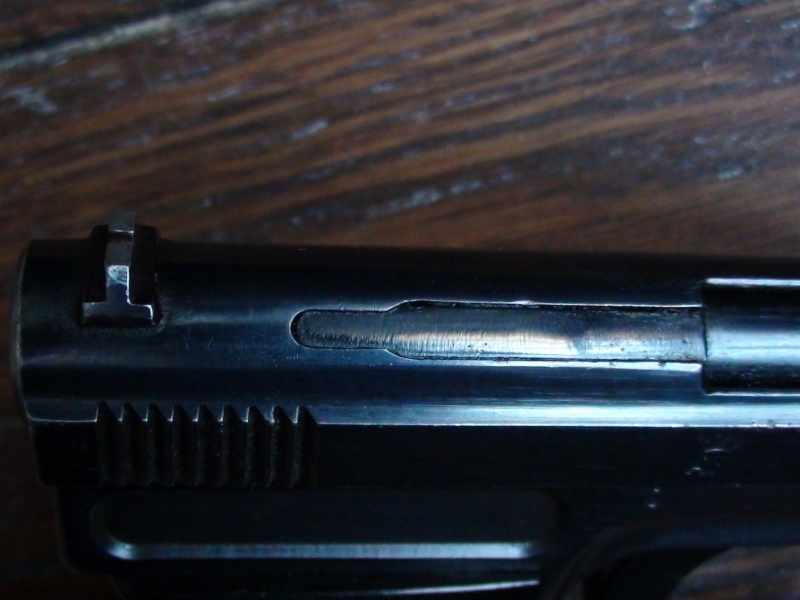 I now see that the magazine is a Sidelatch magazine but it is blued where Sidelatch magazines are typically nickel plated. 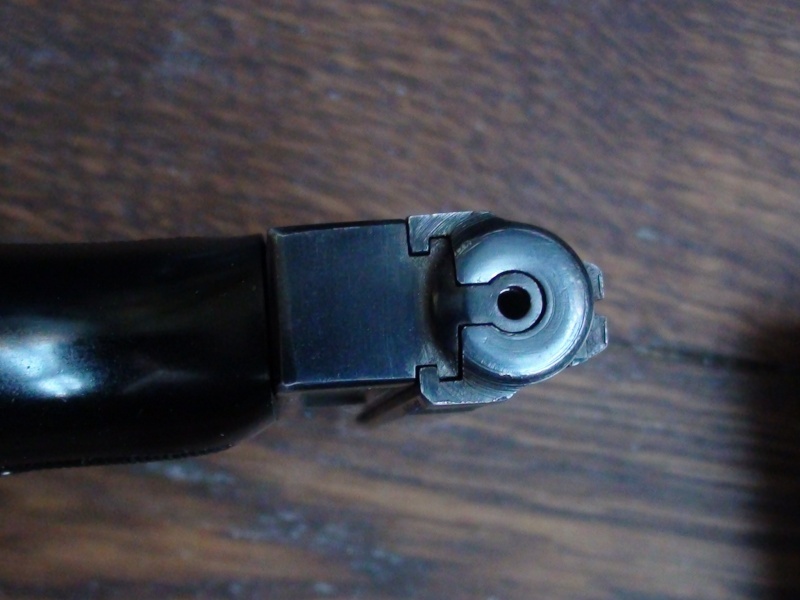 The front sight is correct for a Sidelatch and I now see that the barrel take down rod is held in place by the typical Sidelatch notch in the bottom of the barrel. The serial number places it in the middle of Sidelatch production. Does it have the bottle neck shaped extractor? My guess would be that you have a workshop prototype. 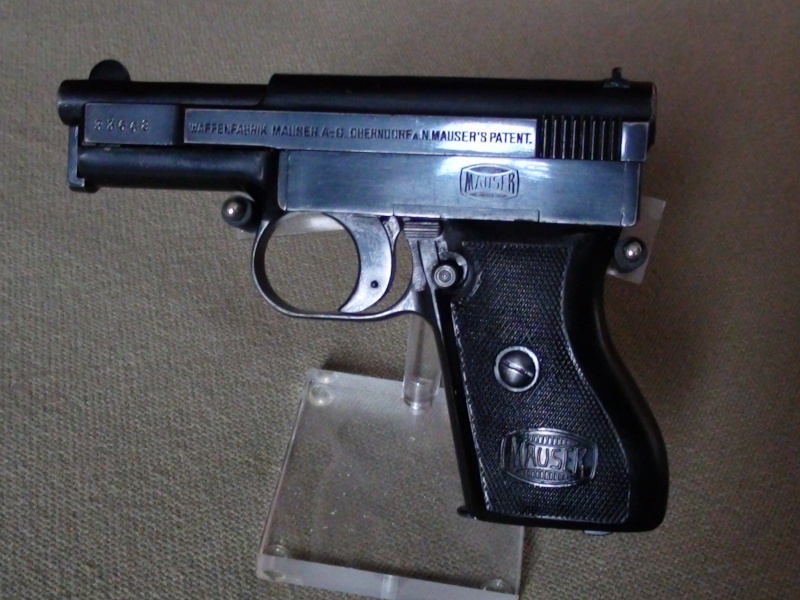 It was most likely made to test some new ideas for production most notably the method of machining the trigger pivot into the frame so the side latch feature could be dropped. This is a best guess on my part. 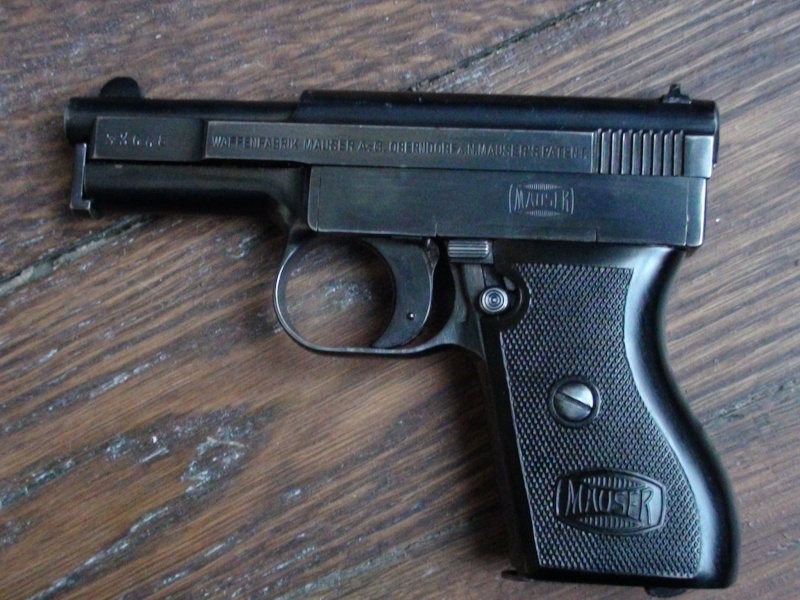 It could be a one-of-a-kind pistol. Congratulations! Thank you again for all these information! Here are some more close-ups I just made. Yes, that is a Sidelatch bottle neck extractor. Please don't tell me this example has been deactivated? Are you in France? 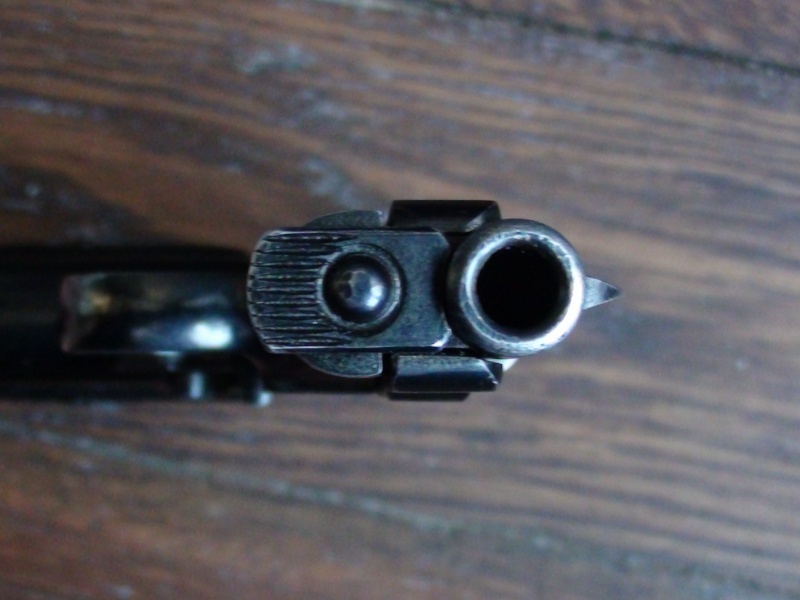 I am afraid it has been Yes, I am in France, where the laws are somewhat stupid in some extend regarding guns (if you are only a collector - and not a shooter - you can't own any live guns!). I did buy this specimen already deactivated (I would never do such a thing ! ). That is truely a shame as it is a key peice to the evolution of the design. Small consolation , it still can be cocked, stripped and dry fired ! Inspecting furthermore this specimen, I noticed a small star on the bottom of the magazine. Any thought about that? 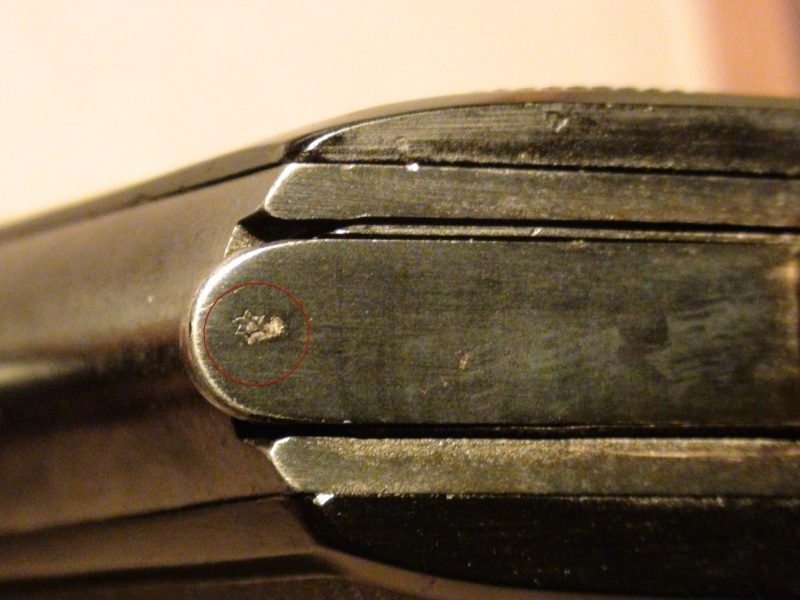 The star on the base toe is typical of all Sidelatch magazines. Thank you for all these valuable information! Do they weld a piece down the barrel? They weld the striker and force a screw in the barrel ! Those French barbarians!! !